Ford took the wraps off its 2017 Escape crossover just days before the start of the Los Angeles auto show. This compact SUV goes on sale next spring. 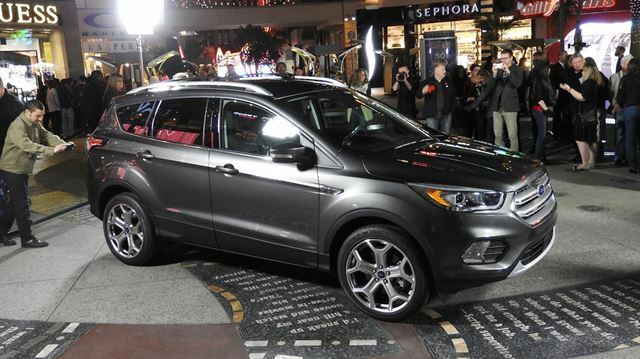 LOS ANGELES, CA: The best-selling SUV in Canada got the Hollywood star treatment as Ford unveiled its 2017 Escape prior to the opening of the Los Angeles auto show. Just across the street from the studio where Jimmy Kimmel Live is produced in Hollywood, Ford took the wraps off its new Escape at the same location as where the third generation was introduced a few years back. Ford is hoping they are two-times lucky and the new version is as successful as the current one, which leads the way in the Canadian sales race among compact crossover SUVs. This is a high-growth segment in the auto industry as compact SUVs are about to surpass compact cars in sales in the Canadian market. In fact, SUVs overall now account for one-third of all vehicle sales and that number is expected to climb to 40 per cent by 2020. In Canada, Ford sold 52,057 Escapes in 2014 and this year sales sit at just over 40,000 at the end of October, down 10 per cent from a year ago, but still well ahead of fast-charging challengers like Toyota RAV4, Honda CR-V, Nissan Rogue and Mazda CX-5, which all have enjoyed double digit increases. With the competition nipping at their heels, Ford is taking the redesign of the Escape very seriously. “This is a big deal for us,” Greg Watkins, Ford of Canada’s SUV product manager told a group of Canadian auto journalists in a conference call in the week leading up to the LA show. While Ford calls this a new generation of the Escape, it is more like an extensive mid-cycle refresh. There is no new platform, but there are two new engines, a freshly designed interior and new looks front and rear on the exterior. When the 2017 Escape goes on sale next year, it will be loaded with a host of new features like a start-stop fuel-saving system, driver-assist technologies like enhanced active park assist, adaptive cruise control and a lane-keeping system. None of this is new to the industry but they are to Ford in this segment and demonstrate how far compact SUVs have evolved over the years. “We’re bringing our best stuff down to our most affordable, highest-volume SUV,” said Milton Wong, chief engineer for the 2017 Escape. Ford will offer two new EcoBoost engines on the 2017 Escape, a 1.5-litre and a 2.0-litre twin-scroll. Standard will be a holdover 2.5-litre four-cylinder engine, which will only be available on the entry-level S model. All come with a six-speed automatic transmission. Ford expects 90 per cent of its customers to opt for the new EcoBoost engines, which will feature the auto start-start technology. Unlike some of the competition where the start-stop system is somewhat clunky, Ford promises its technology will be almost seamless with a quieter, smoother restart. Ford said the average driver spends 16 minutes a day with the car idling in traffic and by shutting off the engine when the car is stopped, fuel economy will be improved four to six per cent in stop-and-go traffic. One technology that is new and available on the 2017 Escape is Ford’s SYNC Connect. This new app allows smart phone users to lock and unlock doors, check fuel levels, remotely start their vehicle and even locate where it is parked. Wong said Ford has listened to its customers with a vehicle that has been redesigned from the inside out. For example, customers these days need more storage cubbies for their phones and ever-larger sunglasses so the new Escape has a redesigned centre console with lots of storage, thanks in part to the use of an electronic parking brake in place of the old handle and lever system. Outside, the front end has been refreshed and now has a look akin to the Edge and Explorer SUVs. There are new headlights up front and LED taillamps at the rear. While we haven’t yet driven the new model, Ford says its engineers have gone to great lengths to the make the cabin quieter with greater use of insulation and seals to keep road and tire noise out. Three trim levels will be offered, S, SE and the range-topping Titanium with both front and all-wheel drive. With the twin-scroll 2.0-litre EcoBoost engine, the tow rating will be 3,500 lb, tops in the segment. The other two engines have tow ratings of 1,500 and 2,000 lbs respectively. Historically, 20 per cent of sales in Canada have been in the top trim level and 53 per cent of Escape buyers are female. The 2017 Escape is slated to go on sale next spring.